AMD Wish List Contest - Week 1! The temperatures are dropping, red coffee cups can be spotted everywhere you turn and jewelry ads constantly blaring on the TV. It can only mean one thing, the holiday season is here! Here are AMD we want to make your technology wish list come true, introducing the AMD Wish List contest! We want to see what you are asking Santa to bring you this year. One lucky winner per week will win an AMD product from their wish list! Have at least three (3) followers in the Red Team Forum. - Too busy scouring for deals to create an image? We've got you covered, you can use our Wish List Template! 6. That's it! Want to increase your chances of winning? 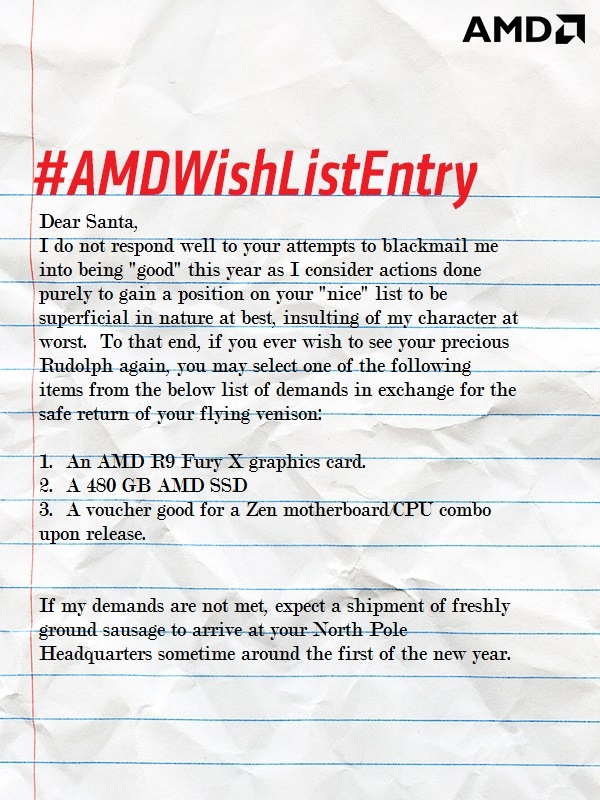 Submit your wish list on Twitter using #AMDWishListEntry! A random drawing will take place among eligible participants. The winner will be chosen on November 27, 2015 at 3:31pm CST and announced here on the thread soon after! Be sure to read theAMD RED TEAM WISH LIST CONTEST OFFICIAL RULES before you enter! Happy Holidays and Good Luck! NOTE 11/28 @ 3:30PM CT: I'm going to lock this thread so that there is no confusion on which week to enter your Wish List! Head on over to Week 2 and submit your Wish List there! Just because it worked the last time... haha! "If it's stupid and it works, it isn't stupid." I thought IT's motto was "Reboot!" P.S I see that both contest drawings are being done at the same time! Imagine if the same person won both! it was meant to say 240gb ssd's lol. I decided to keep it reasonable . . . sort of. Oh how grateful I'd be if I won! Would a note from my Mom be OK? Best of luck and Happy Holidays everyone. Likewise my there Friend !!! GAME ON !!! For me its has the be Fury X. Really hopping i can get this amazing GPU so i can upgrade to 4K and play all the new games. Just the basics this year, Please!! I wish all who entered , good luck and may the god of good luck and karma for once be gracing my luck but it I do not win, I wont be dissapointed as 5 lucky persons will have more gaming luck then be fore this was drawn. So just to be sure. We do not have to enter a new picture/video here next drawing period? The same goes for Twitter? You will not have to create a new Wish List, but you will have to enter again every week for the drawing on both the forums and Twitter. One the week 1 drawing period is over, I will create a week 2 thread for you to upload your wishlist to. Same for weeks 3, 4, and 5! On Twitter, you will have to Tweet your list again using #AMDWishListEntry during the entry periods. Good luck everyone for week 1! Well, here's mine. Here's hoping for something more for family and friends than myself. Happy holidays and thanks for sharing the #PositivityThroughGaming! nice thoughts.. and thanks for you message. Here is my not so expensive list, haha. Thanks everyone for the opportunity!!! Congrats to akariko on winning Week One of AMD Red Team Wish List Contest! Congrats to akariko & itizeasy! Christmas has come well & trtuly early for you both. I am... So happy with this prize! Here I was lazily on the couch watching some show, meanwhile going through the mail on my phone and then I see this message. After, all I remember is me shouting something random loudly and nearly fainting when I jumped up in excitement! To give you some impression of how moved I am. Well if it's up to me, a Fury X yes please! Very curious about HBM! This gift is (was!) nearly as unattainable as the other things on my list! Go figure! [...] Finally I can game on par with Downl1nk & Indie! Excellent!!! Super happy for ya. Gratz again. hey dude heads up you posted in the week 1 this one ended. You need to head on over to that there other thread called AMD Wish List Contest - Week 2!